Short on Cash but need a new set of tires? Well look no further, we can help you out with a SNAP! This financing option will help you to walk out today with a new set of tires TODAY. Just click the link below, get approved and you'll be on your way. The only payment upfront is the $40 processing fee brand new tires in tow. No worries about having to be brand specific as SNAP! Financing has all of the tires we keep in stock covered! JUST CLICK ON THE GREEN AND BLUE SNAP BUTTON BELOW!! MONEY TIGHT? 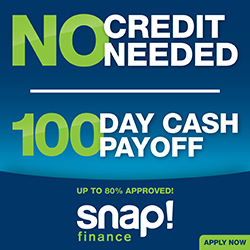 CLICK BELOW AND SEE WHAT YOU QUALIFY FOR! !